The Names: Find Your Ancestors! The ladies of FREED–Female REEnactors of Distinction–will grace us with their presence May 11! IMPORTANT NEWS: The DC Department of Parks and Recreation late this year will be making improvements to Walter Pierce Park, the site of the 19th Century African American and Quaker cemeteries. In 2018, a core group of descendants and volunteers who have been most active in the cemeteries’ protection asked the Parks Department to consider creating an “ANCESTORS PAVILION” to memorialize the 8,428 people buried at the site. YOU CAN SEE THE DESCENDANTS’ PROPOSED PLAN HERE. An extensive geophysical survey of Walter C. Pierce Community Park in Adams Morgan, Washington, DC, has detected at least 35 graves from the African American and Quaker cemeteries that once occupied the site. It’s possible that hundreds or thousands more graves are still intact some 30 feet below the present-day surface of the park, where they couldn’t be detected by scientific equipment. There were at least 8,428 burials made in the cemeteries during the 19th Century. Dr. Jarrod Burks of Ohio Valley Archaeology Inc. conducted the geophysical survey, using ground-penetrating radar, magnetometers, and high-tech topographical analyses of the site’s contours over time. His report helps explain the earlier archaeological findings made by Howard University biological anthropologist Mark Mack during a multi-year, non-invasive survey of the site. The Walter Pierce Park Archaeology and Commemoration Project is grateful to Dr. Burks and DC City Archaeologist Dr. Ruth Trocolli for permitting us to publish and share with you here the Results of Geophysical Surveys in Walter C. Pierce Community Park, Washington, D.C.: A Geophysical Search for Evidence of Graves Related to the Mt. Pleasant Cemetery. For the history and archaeology of the site, read our Report to the Public on the Archaeological Investigation of Walter C. Pierce Park and Vicinity 2005-2012 by Mark Mack and Mary Belcher, published in 2013. The National Park Service in 2015 named Mt. Pleasant Plains Cemetery at Walter Pierce Park a National Underground Railroad Network to Freedom site; click to read the Mt. Pleasant Plains Cemetery at Walter Pierce Park Underground Railroad Nomination. FIND YOUR ANCESTORS on our Walter Pierce Park Burials Database documenting the 8,428 people buried in the 19th Century cemeteries. IN THE 19TH CENTURY, TWO CEMETERIES OCCUPIED SEVEN ACRES OF LAND that today is Walter C. Pierce Community Park, located in the Adams Morgan neighborhood of Washington, DC. The cemeteries were the Friends Burying Ground–the city’s only Quaker cemetery–in use from 1807 to 1890, and a much larger African American cemetery known as Mt. Pleasant Plains Cemetery, in operation from 1870 to 1890. The cemeteries were almost lost to time. Portions of the seven acres were sold off and the graves forgotten as the city grew around them. Developers in the 1950s ravaged the land to build several large high-rises, but they eventually abandoned their efforts. In the 1970s, neighbors in need of green space successfully persuaded the city to buy the vacant land. In 1982, a city park was born. 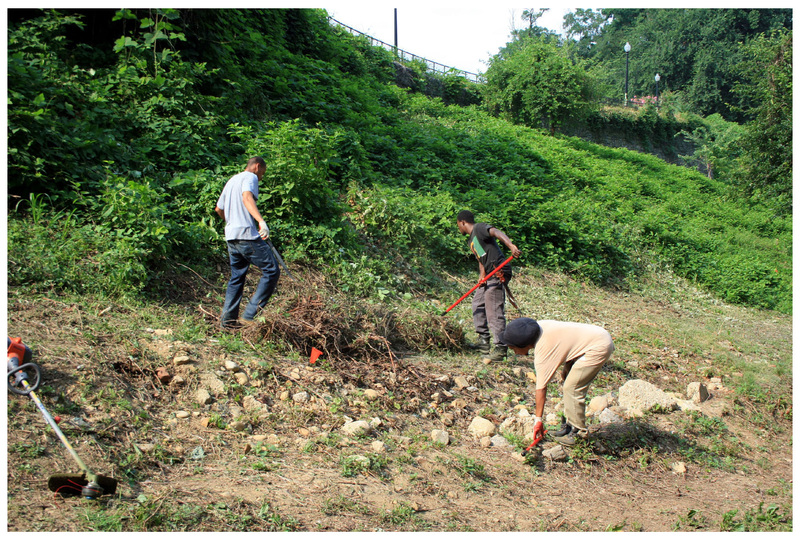 In 2005, concerned citizens and Howard University anthropologists joined forces to protect the unmarked cemeteries at Walter Pierce Park. Their collaboration began in response to a city plan to construct large terraces in the park. Neighbors who were aware of the park’s history as cemetery land were certain that the massive earth-moving project would disturb any graves that might remain. 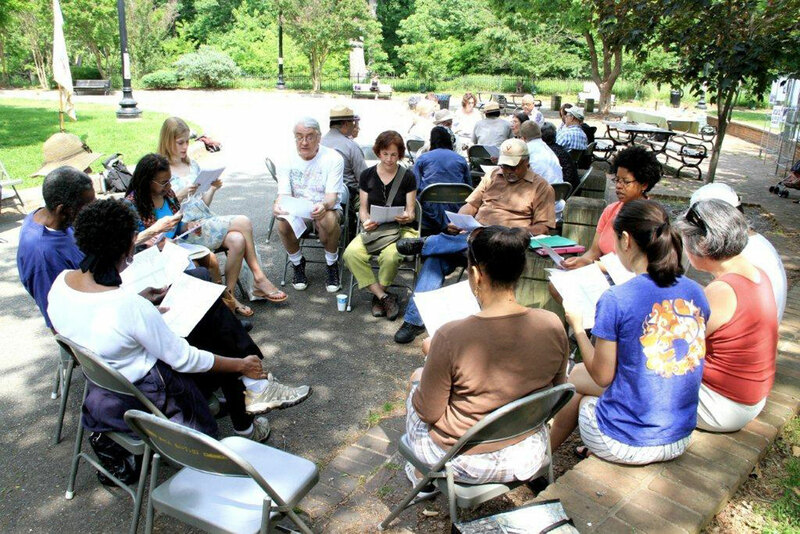 The concerned community was quickly joined by Mark Mack, a renowned Howard University biological anthropologist and laboratory director of the landmark African Burial Ground project in New York. The insignia of the Colored Union Benevolent Association which founded Mt. Pleasant Plains Cemetery in 1870, from documents at the National Archives. After months of debate, city officials relented, agreeing to delay and downsize their construction plans. They allowed Professor Mack and a team of Howard U. students and independent historians to survey the park. Grants to pay the students and buy supplies were obtained through a nonprofit neighborhood group, the Kalorama Citizens Association. 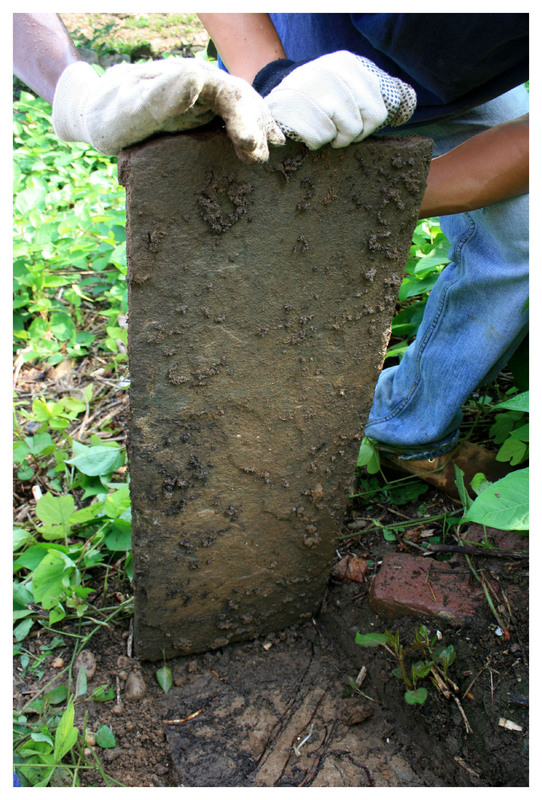 After three years of work in the park, the Walter Pierce Park Archaeological Team received city funding for further exploration, with the DC grant administered by the nonprofit Washington Parks & People. While one part of the team worked in the park, team historians reviewed city death records to document the names, addresses, causes of death and other biographical information of 8,428 people whose remains were buried in the Walter Pierce cemeteries. In the field, the Archaeological Team surveyed the park using only non-invasive means. They did not dig because the purpose of the work was to protect, not disturb, graves. They found ample evidence of the cemeteries. The exposed skeletal remains of at least nine individuals were found. Coffin hardware, headstones, and grave offerings were found. 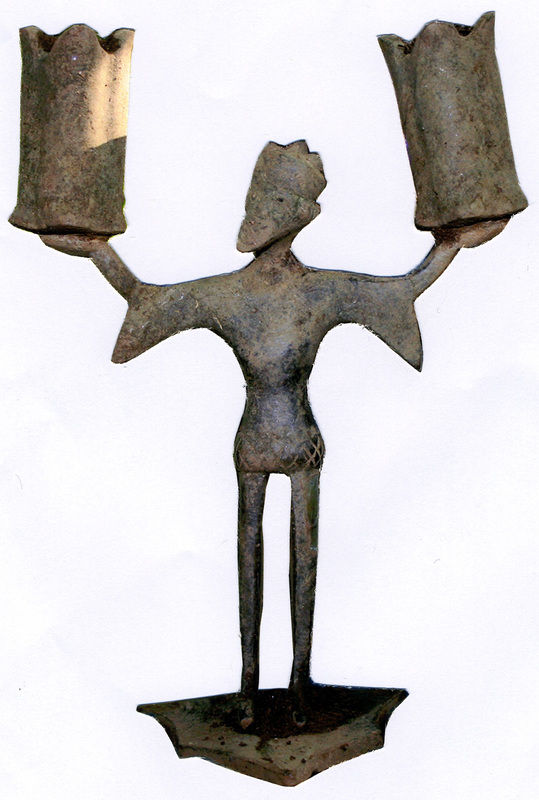 The chock-a-block nature of some of the finds–including exposed remains and artifacts scattered on hillsides–provided evidence of the cemeteries’ desecration and neglect throughout most of the 20th Century. The Walter Pierce Park Archaeology Project honors the past and welcomes permanent protection of the site in the future. We look forward to finding ways to commemorate those whose remains were laid to rest here, so that an estimated million descendants might find their ancestors at Walter Pierce Park. Will be checking to see if my great grand mother Emily Edmonson, from the Book Fugitives of the PEARL by John L Paynter is bury their. I was so happy to be able to participate. Speaking the names of the ancestors into the universe honors their existence however brief and the important contributions they made to building this nation. Hi Linda: There are no markers in the park honoring the cemetery, although we want to have a permanent marker there honoring this important, sacred space. The Edmonson family was very much involved in the cemetery’s creation, and there were at least 23 members of your extended family buried there. We have no map of which graves are where. Some Edmonson Family graves were moved to Harmony Cemetery in DC, which no longer exists, and the graves were then moved to Harmony Cemetery near Landover, Maryland. I don’t know if they are marked out there in Landover. Two sites you might want to visit across the river from DC is in Alexandria where there’s a beautiful stone sculpture of Emily and Mary Jane Edmonson at 1701 Duke Street, near the house where they were held by slave traders; there’s also a place just a few blocks south called the Freedom House Museum in the 1300 block of Duke Street, which is the site of a former slave jail. If you would like me to walk you through the Walter Pierce Park site, I would be happy to do so–just drop me an email at maryjbelcher@comcast.net, and we can plan a time. Thanks so much!